The shovels are back out on the extension to Thames Trent that I threatened when the route was uploaded so here's the first update. First grab is the plan of what gets added. 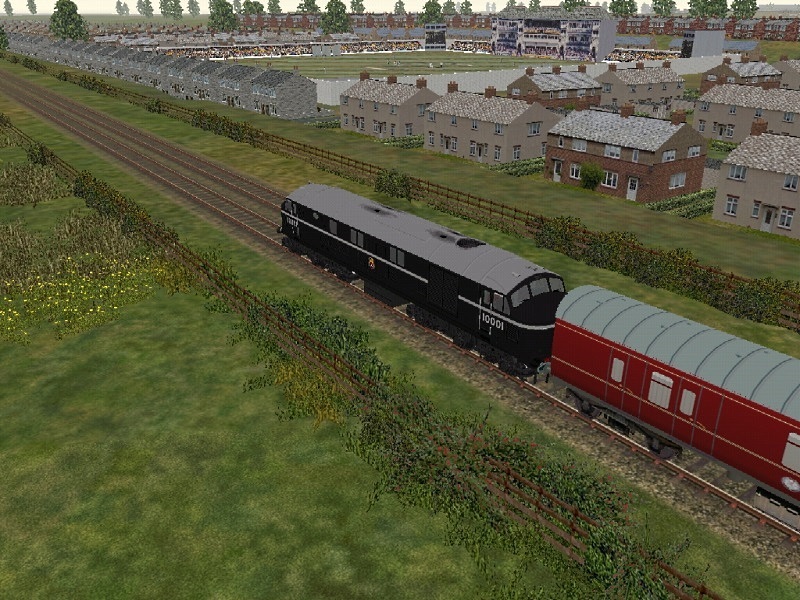 I'm mostly doing track laying at the moment, with the section from Corby to Saxby completed. 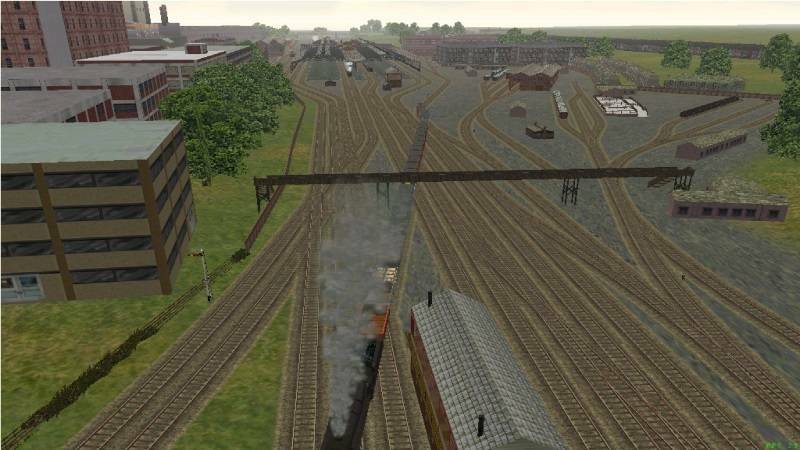 In the next few days all the trackwork to Nottingham should be finished. From then on will it be a mixture of trackwork and scenery making so that when the last bit of track is laid, the scenery is about 30 miles behind. Thames Trent was about 150 miles in length and a guess will put the new mileage at about 300. 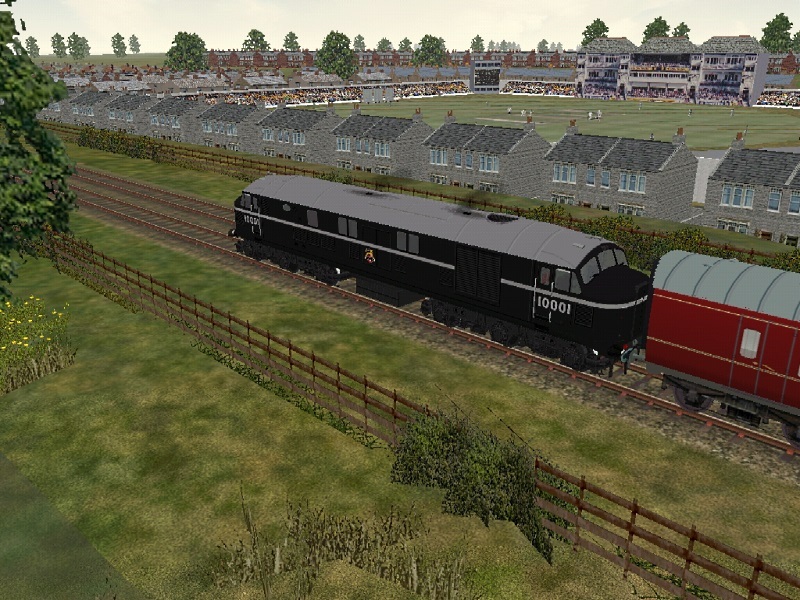 Lets hope MSTS copes with that many miles. 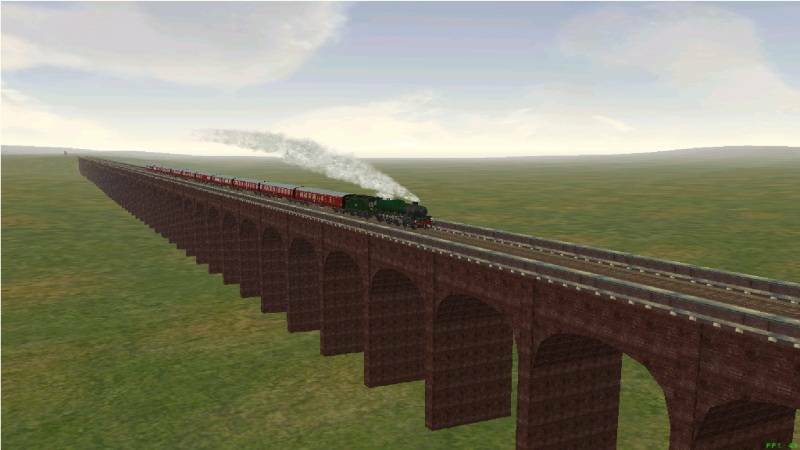 The next 2 grabs are of Harringworth viaduct at just short of a mile long and 82 arches. 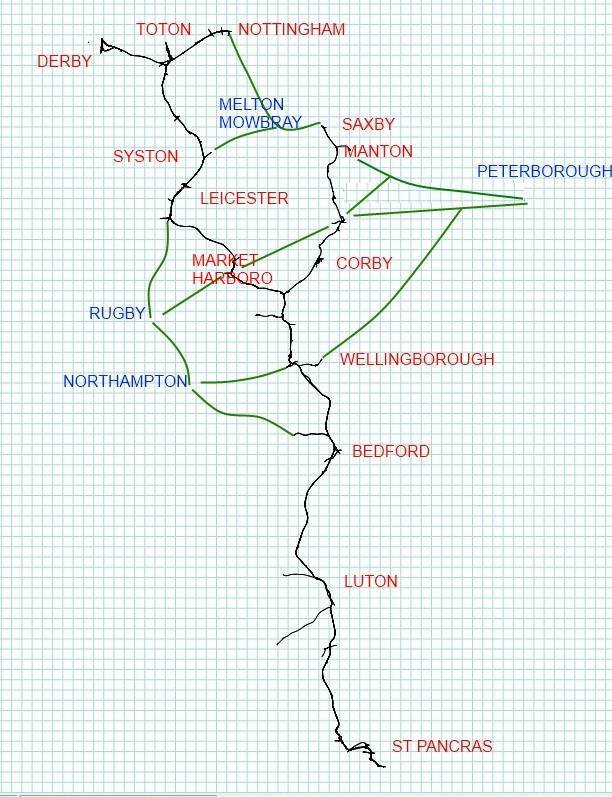 The lines going under in the second grab will eventually join Peterborough to Market Harborough and Rugby. Any questions welcome, except when will it be finished. 300 miles! I don't know how you do it Clive, but good luck with the route - it's bound to be popular. You're too kind to us, but once again things are looking good. Hopefully yes. 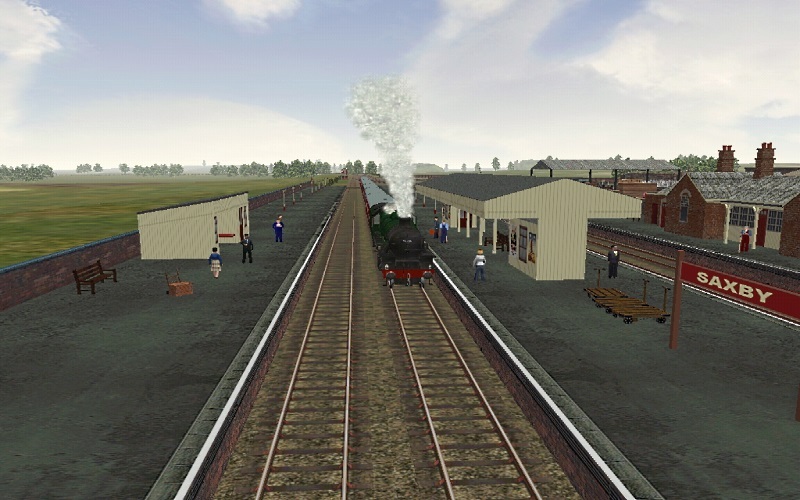 There is a very good web site describing the Syston - Peterborough line, so information wise, i'm well served apart from the actual arrival at Peterborough. 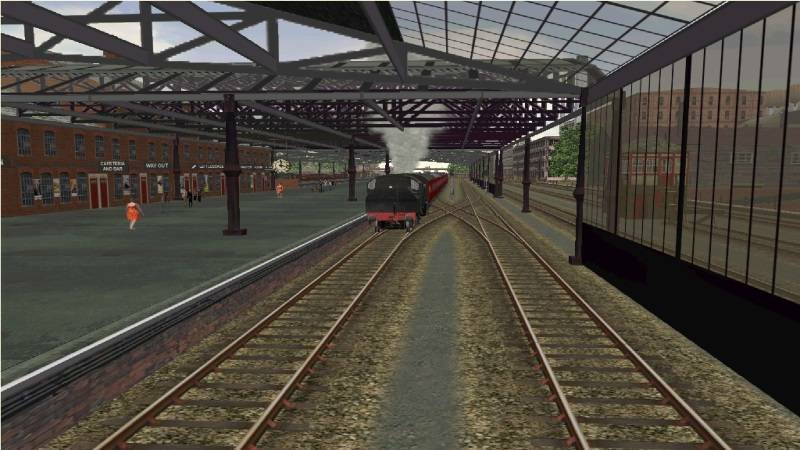 I'm finding that part confusing at the moment (station wise) but i'll get there in the end. Did you get the track plans I sent you. 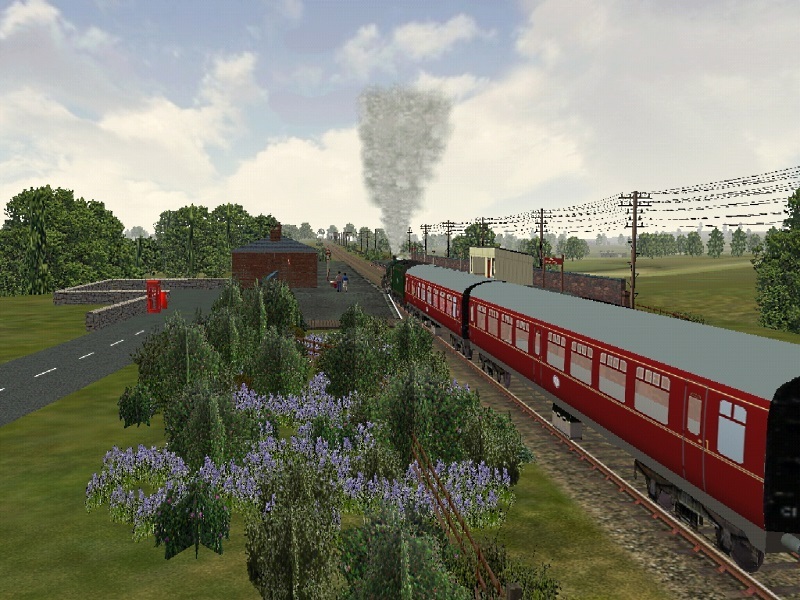 Nice one Clive, looking forward to the upcoming extensions to this fabulous route, one of the top ten for MSTS. Keep up the good work. dee4141 wrote: 300 miles! I don't know how you do it Clive, but good luck with the route - it's bound to be popular. I don't know how you do it either! For my first foray into route-building, I'm happy with about 25-30 miles of track, but 300 makes it pale into insignificance! Keep up the good work, Clive, I'm sure it's going to be fantastic. I think it was Alec, commenting on the Woodhead extension,who said it was interesting to watch how a route develops. 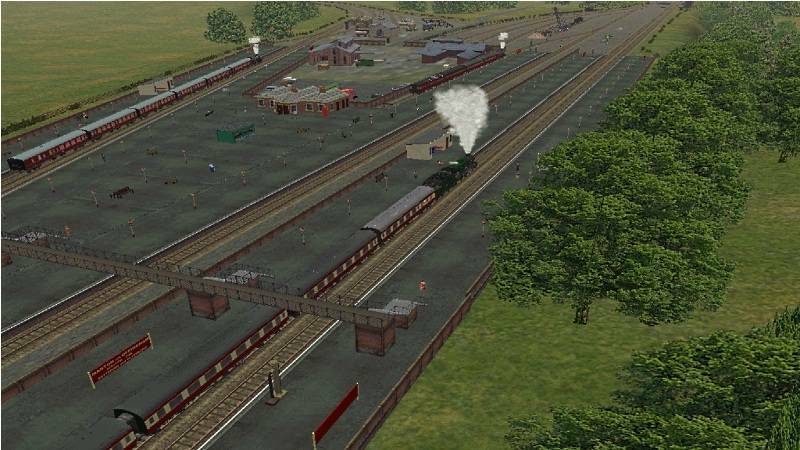 It gave me and idea of showing how just one station gets built and why routes can take quite a time to make. 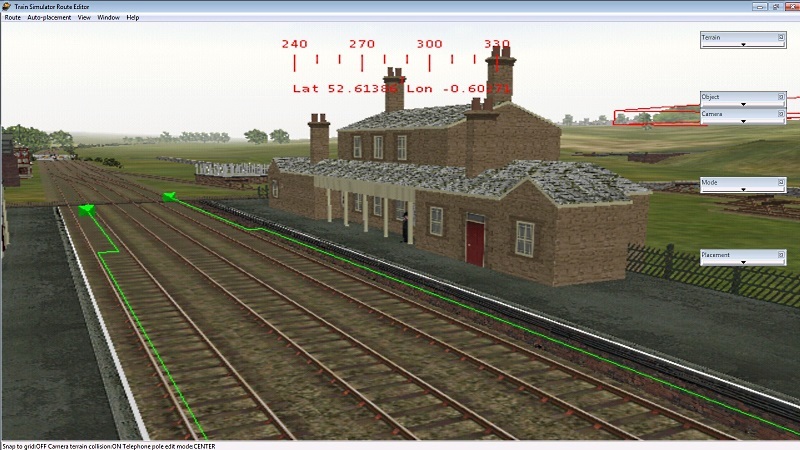 The first 4 hours........................ Track laid at Manton and, because it was a V shaped junction/station, new platforms had to be built. 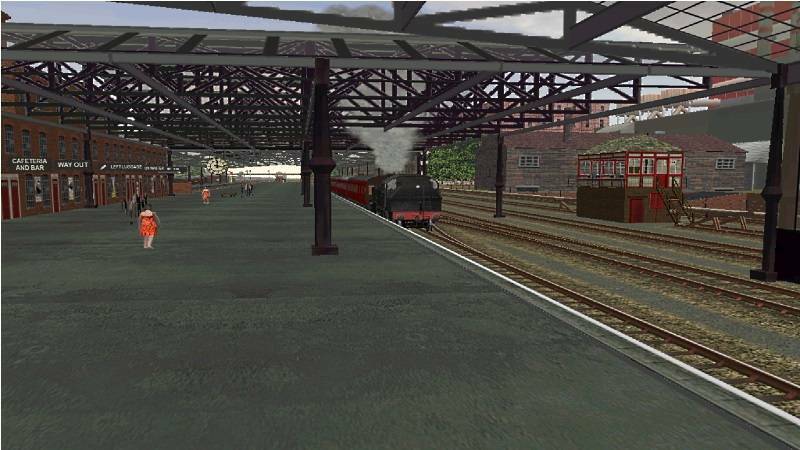 As the station is a bit of a one off, a new building and footbridge was needed. 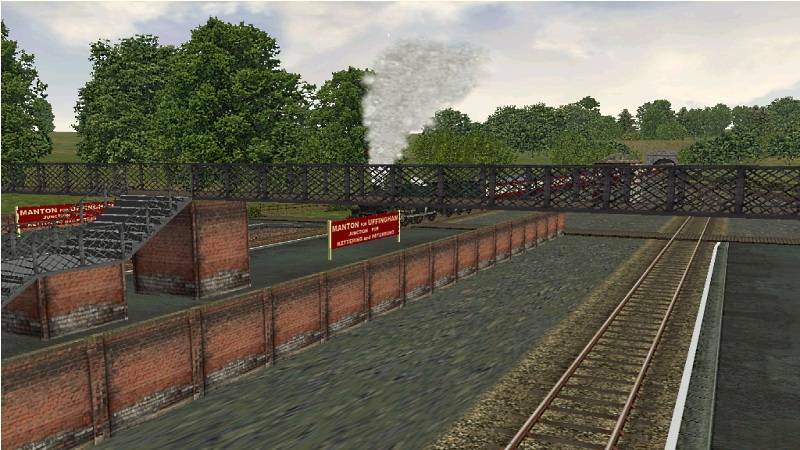 Also station signs and a road overbridge. 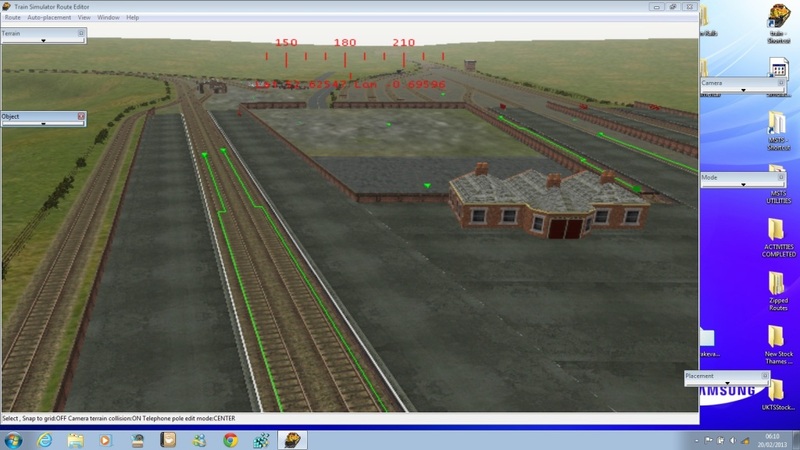 The next 6 hours making the models and then another 2 adding the boundary fences/terrain patches. 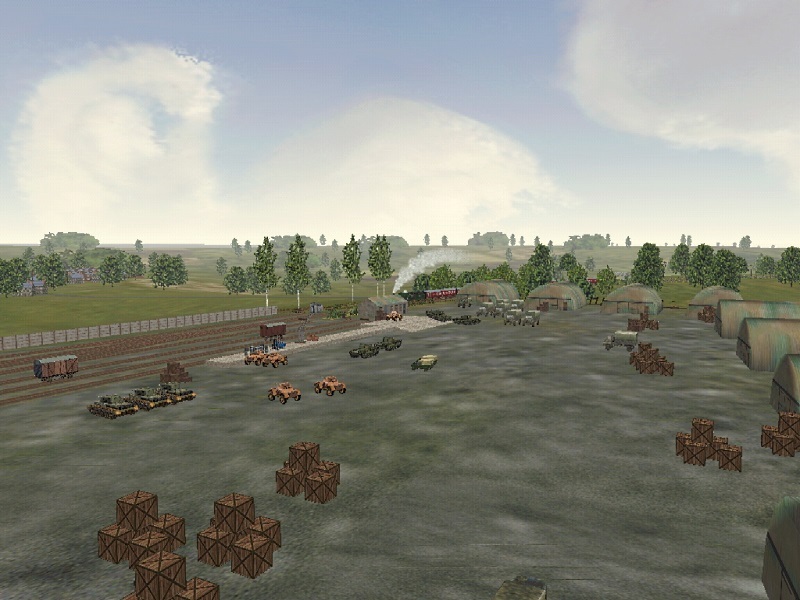 Finally adjusting the terrain, adding the clutter, signals, trees (i do like adding trees ) to give the final impression. 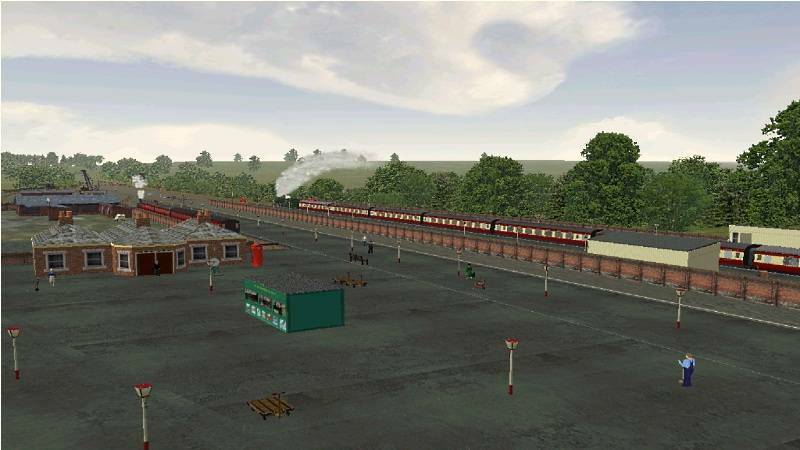 4 hours later........the station as it will appear as you drive the route. Whilst I can't view the shots here on my works computer, I am excited about this post and look forward to happy viewing this evening. Thank you for taking the time to share this with us Clive, it's much appreciated. Thank you for showing a step by step making a station,I didn't realize just how long it takes make them,I know I wouldn't have the patience to do it. It was well worth the wait. Thank you. 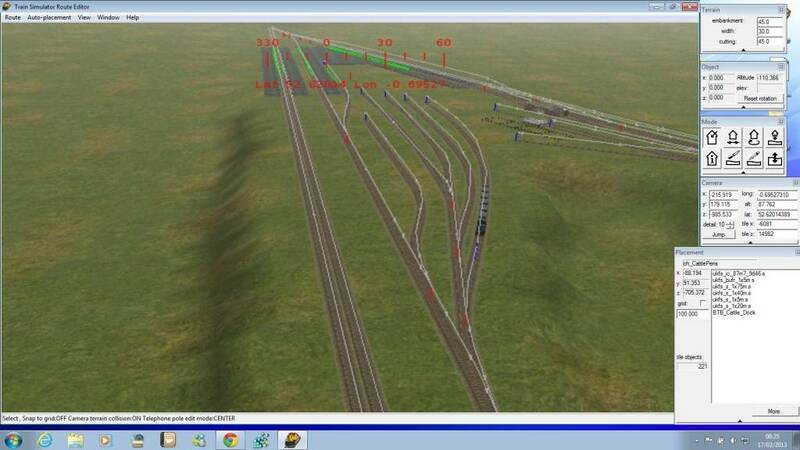 Wow Clive, that looks nice and really gives an insight into building a route! A great job and in keeping most definitely with the Era! Lets hope once I have mastered the DEM data etc; I can get my plan/s off the ground. Hi all, after my little diversion into Manton, it was back to track laying yesterday and this morning. Rick Gibbs (who provided a load of information for V1) came good again with pretty much all of the signalling diagrams I need for V2. Nothing to stop me now. 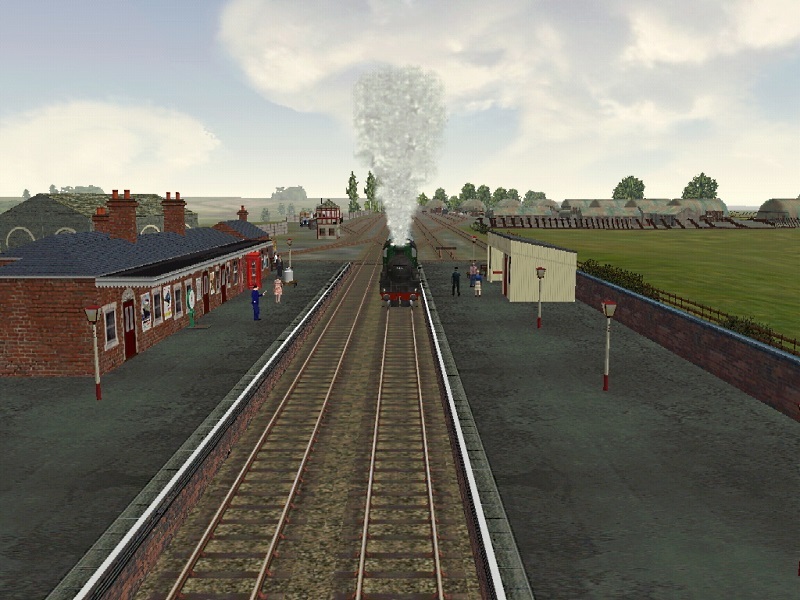 Had a little play last night with a service running from St Pancras to Nottingham via Leicester on the down run and continuing from Nottingham using the Melton/Manton section back to St Pancras. Just over a 250 mile round trip according to the station monitor and took about 4 1/2 hours. It'll be fun trying to set up traffic for that activity. 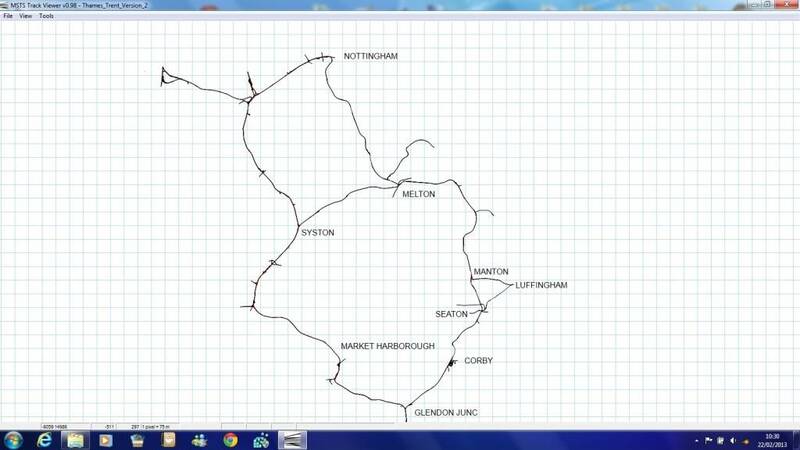 Latest grab of the new track with Seaton to Market Harborough the next target. We really are being spoilt! WOW! That really is impressive Clive, looking forward to the Corby extention. 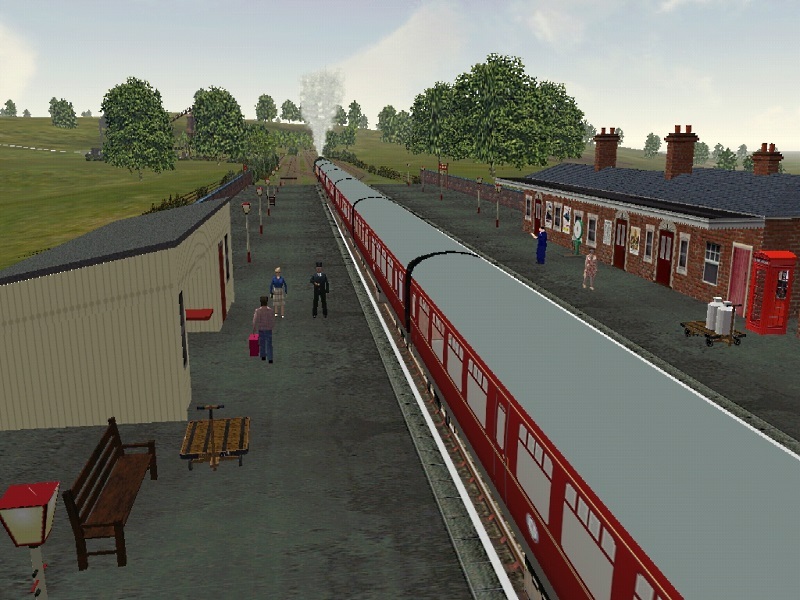 Now, I am going to be cheeky and ask regarding the signalling, if it is at all possible to include some Midland lower quadrant signals here and there? 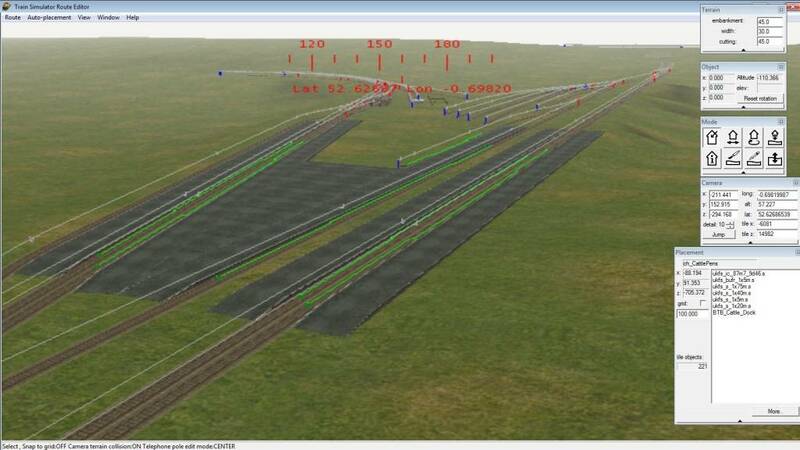 andrew moody wrote: if it is at all possible to include some Midland lower quadrant signals here and there? A quick search showed that Ketton had one of the last surviving lower quadrants, so a good suggestion. I made a few signals for version 1. I wish I had made up a document now of how I made them . Those latest screenshots you posted were a nice way of showing how much work goes into a small area of route building and how each stage brings the area to life. I know I've been there, got the tea shirt. So for those contemplating building a route, you know why it takes such a long time before even a short route gets finished. Route building especially to these standards is just not a walk in the park. Well done Clive, keep up the good work, each mile you complete is a mile less to do. My apologies to Alec and now the first of my route descriptions has been emailed to you. Rugby...... I started and just couldn't drag myself away . 3 weeks later, nearly the finished article. Back to track laying now with Rugby to Leicester the next target. Rugby looks really good,no wonder it has taken so long with the attention to detail you have put in,this is one of the reasons I like your routes. I hope you didn't think I was pushing because this superb station must take priority. I'll probably post your description for SDJR tomorrow, for which I am very grateful. 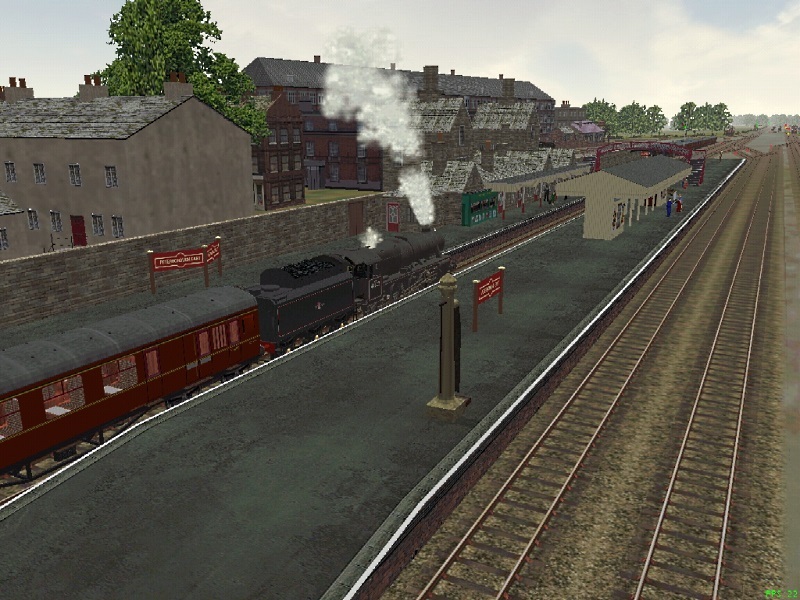 Thanks for the write-up and of course this station. Great to see you are expanding such a good route. I must make sure there will be a pack of suitable Crabs for it if Martin doesn't beat ne to it. A significant day, as all of the 'western' side of the trackwork is now laid. 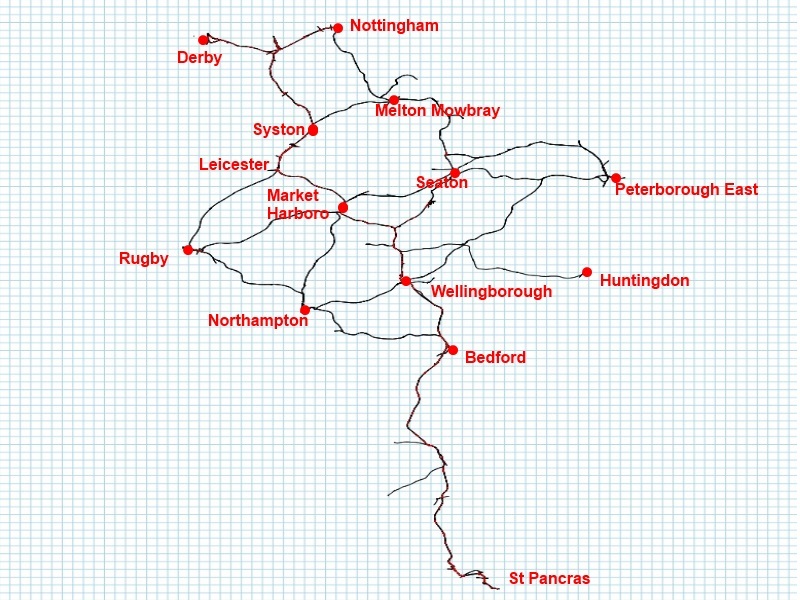 The 3 lines to Peterborough are next and shouldn't take long until I actually reach Peterborough and try to sort out its complexity. Had a play yesterday with setting a path from St P to Northampton-Rugby-Leicester-Derby-Nottingham-Manton-Kettering-St Pancras.................272 miles according to the station monitor . I've not updated this for a while, but things have been progressing. 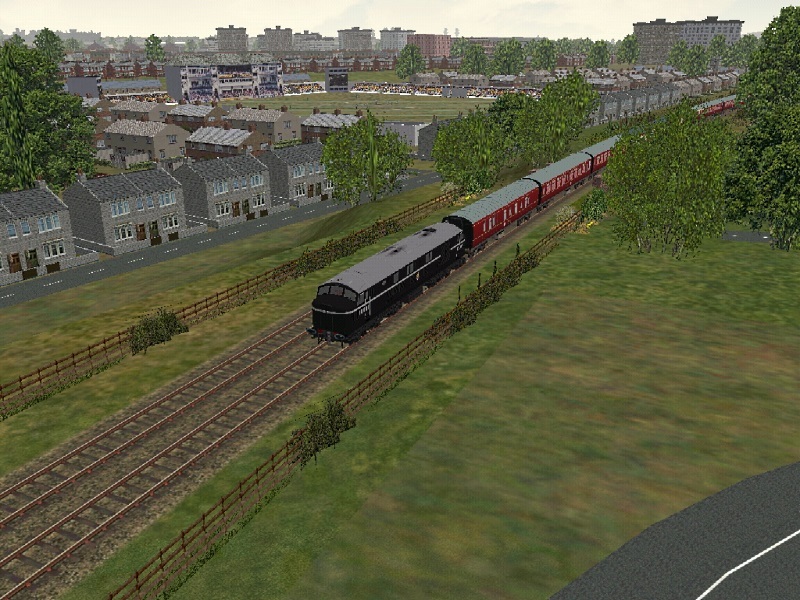 All of the track is now laid for V2 and scenery started from Nottingham towards Corby. A few grabs from a departure from Nottingham on the line towards Manton. Pleased to note that TT V2 is progressing, but can't comment on the pictures as here at work the pictures don't show - can see them on the computer at home. Excellent work Clive. The cricket ground is impressive and looks very realistic. 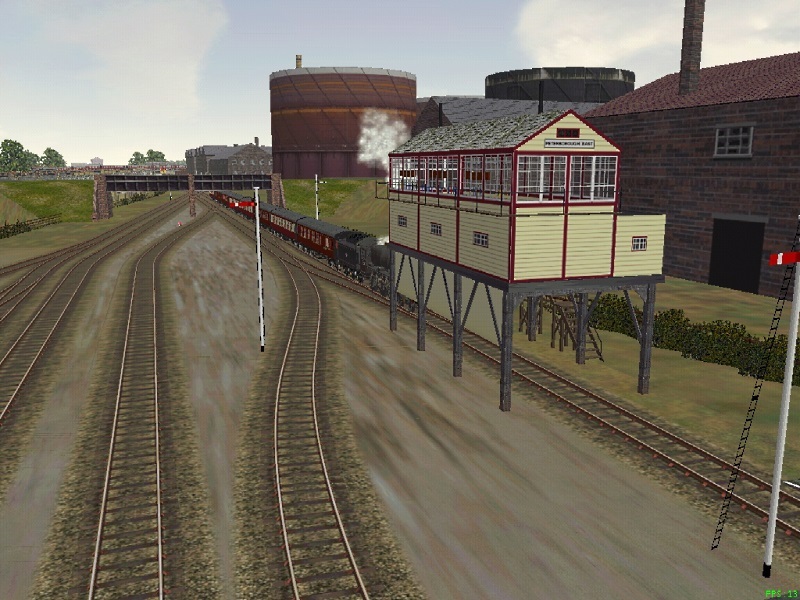 The route is looking good and nice to see Peterborough is included,I can start a train from Cambridge or Ely on MEP+ go as far as Peterborough then switch to your route,the line from Peterborough to Ely is still semaphore signalled. 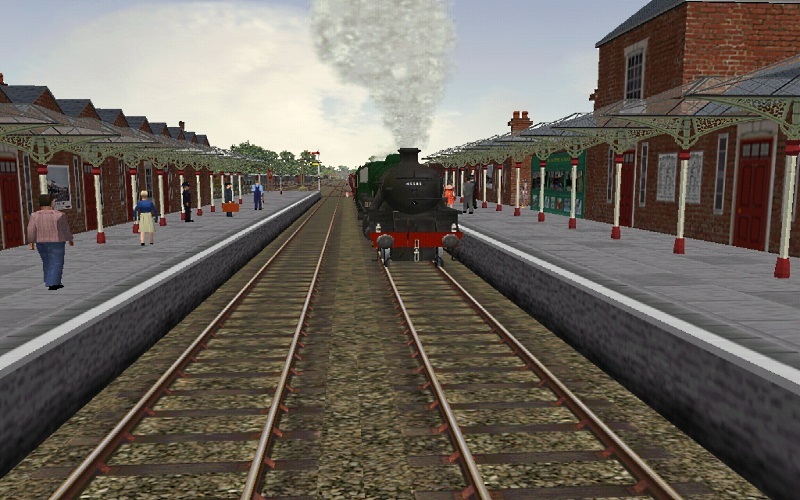 As a piece of History the first route to London from Peterborough went via Wellingborough,the Great Northern came later. 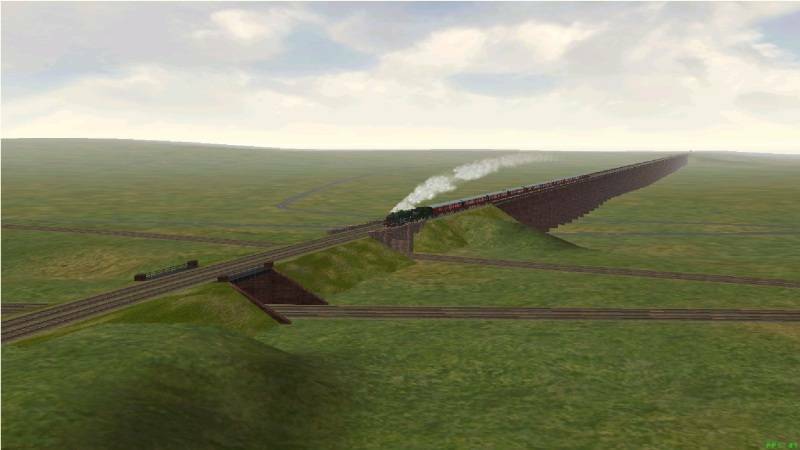 As usual your attention to detail is superb, it's what makes a route stand out. All you have to do now is animate the cricket players! NiallGray wrote: Very nice, Clive. And the crowd doing a mexican wave ? . Animating the players though ???? maybe. 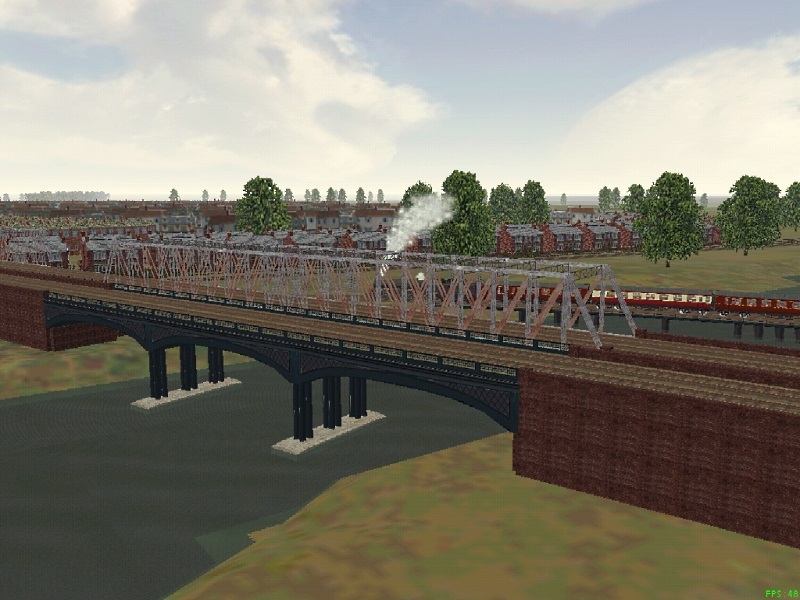 Not been active with MSTS for a few months due to other commitments, but it's nice to see that the Thames Trent V2 is coming along nicely. Dioramas like you have added (Trent Bridge Cricket Ground) is what makes routes interesting. You are doing a great job Clive, so keep up the good work. Still heading south from Nottingham, with a few grabs from Upper Broughton and Old Dalby. 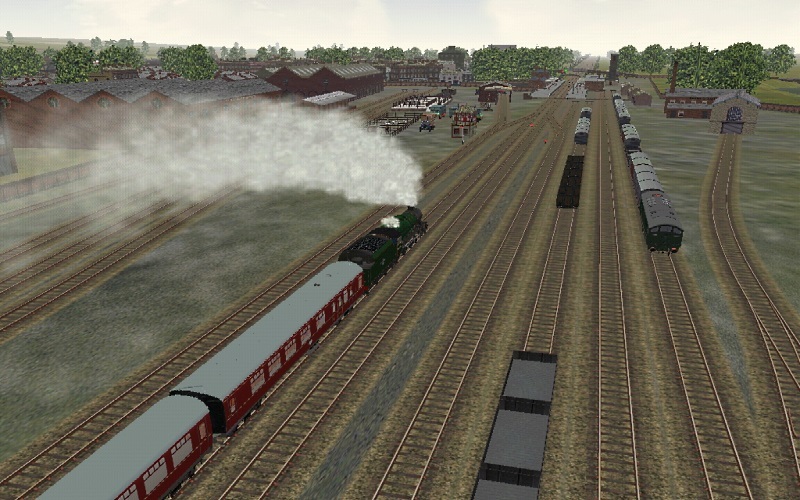 The section from Nottingham to Melton is very rural so difficult to get a lot of variety and also a bit tedious but I'm getting there. 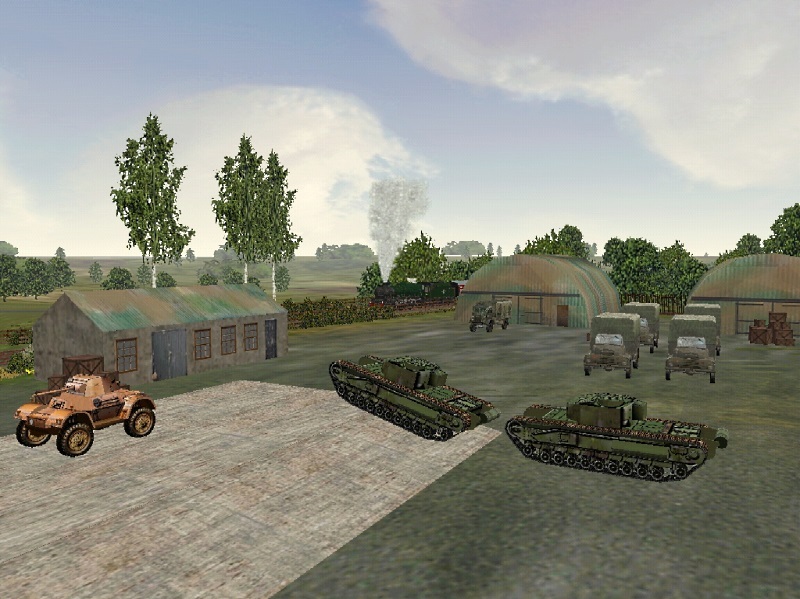 Old Dalby army base with a busy depot of machines and stores ready to be transported South for up-coming exercises on Salisbury Plain. 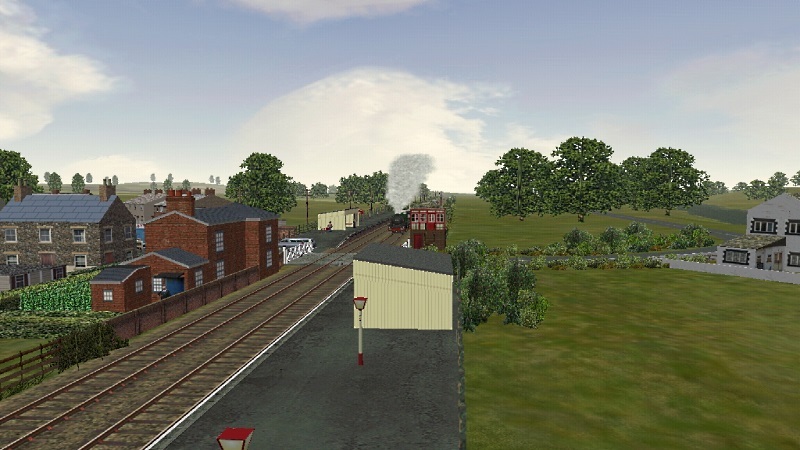 A couple of Old Dalby Station. 3 or 4 miles to go before Melton Mowbray, and the possibility of more substantial scenery. We also had 2 very knackered Centurion Tanks that were used for practice recovery and engine maintainence. Good to see you still making progress. Agree the miles of fields and meadows can get a bit boring at times! Good to see you back navigating - more good shots! Registered just to say how much i enjoy the first version of Thames - Trent. 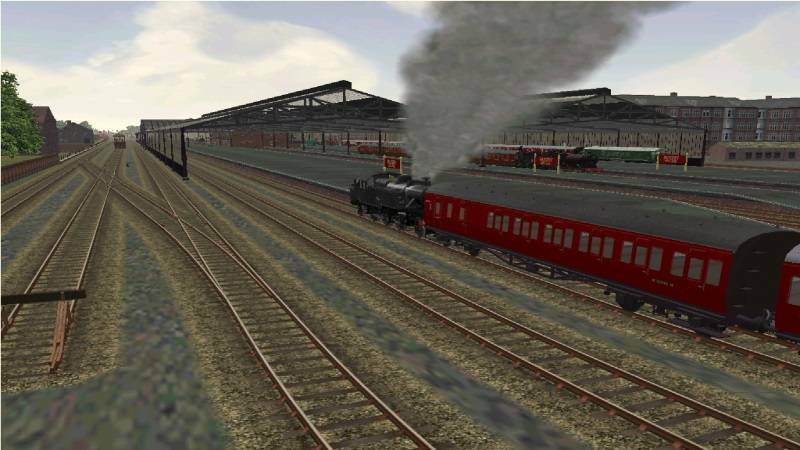 Very pleased to see there is a v2 being created. 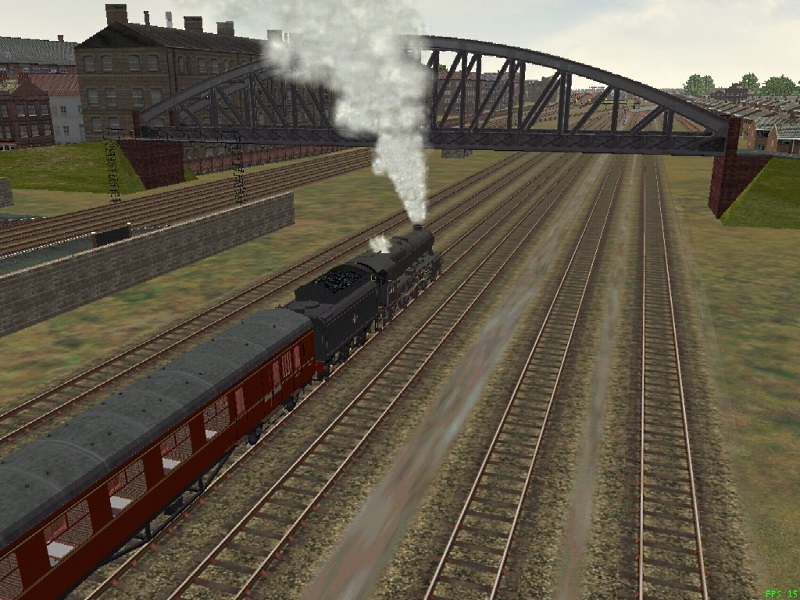 Along with your S&DJR and Bristol - Birmingham, they are my top three choices of MSTS UK routes. Although i must be honest and say, everything is run through OR these days. 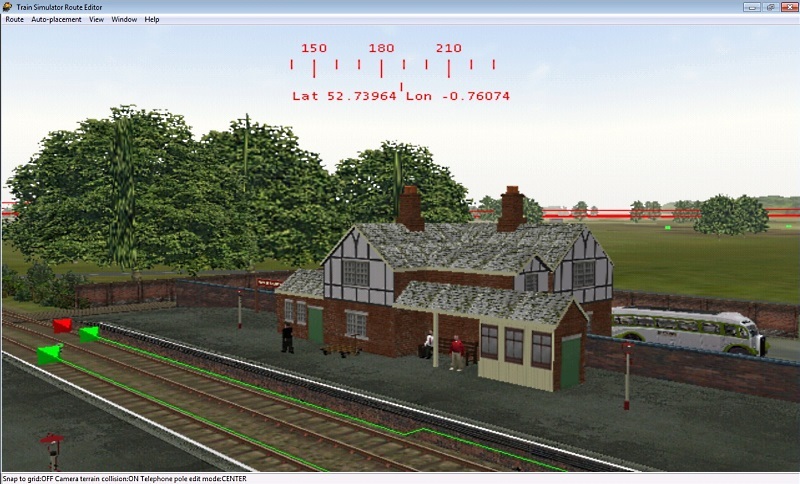 I have Peterborough Station complete as built for MEP, this includes the Main Platform with a Bay Platform and the Main Building and Two Island Platforms, one with Waiting Rooms etc, a Post Office Parcels Bridge, a Footbridge, a Platform Shelter , picture Posters and the Cascade Bridge, most made from directions and Photos by mike hendle. 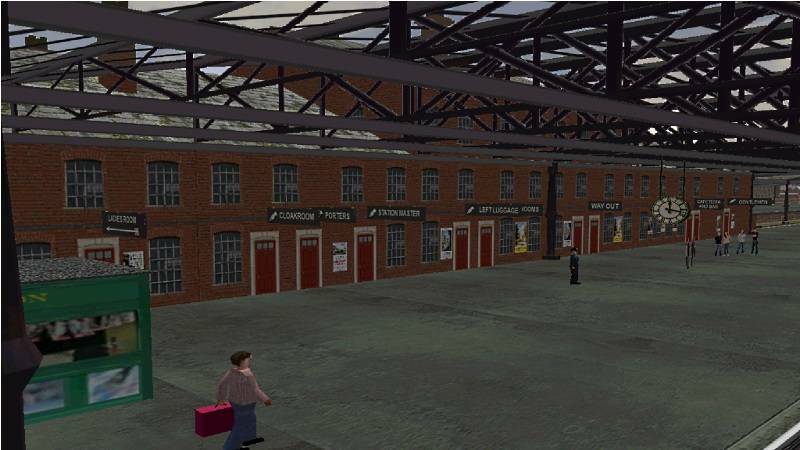 The layout of Peterborough Station was totally different in the Era of Thames - Trent,where Platform 4\5 are in my Photo's that was where the Midland Goods Yard and engine shed were, Platform 2 and the bay platform are just about where the old station was. 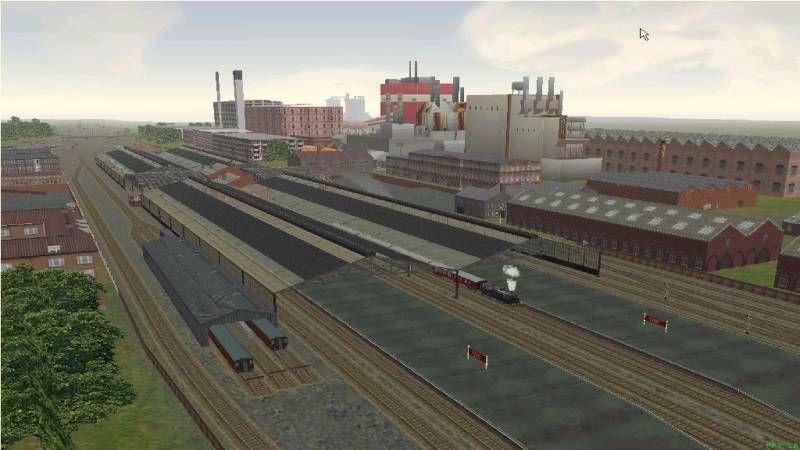 The only things that are in my photo's and the old station, are the Crescent Bridge and and the road bridge at the North End of the Station,the models you made are suitable for the 1970's Blue\Grey era rebuild. Sorry for the slow reply. Not been able to use the internet for a week. As Michael said, its probably 'out of era' for me but thanks for the offer anyway. Good to have you back so to speak, and I hope you have settled back into the UK. I've not had a chance to update lately, mainly because of my move back to the UK and house hunting. Finally we are nearly settled in our new home . These are a few grabs from the middle of August and early September up until a further disruption in the form of a multi vehicle, high speed car accident threw a massive spanner in the works. Luckily we all walked away but bending over a keyboard has been difficult and a tad painful. Life is full of fun, but route building should be able to commence soon. 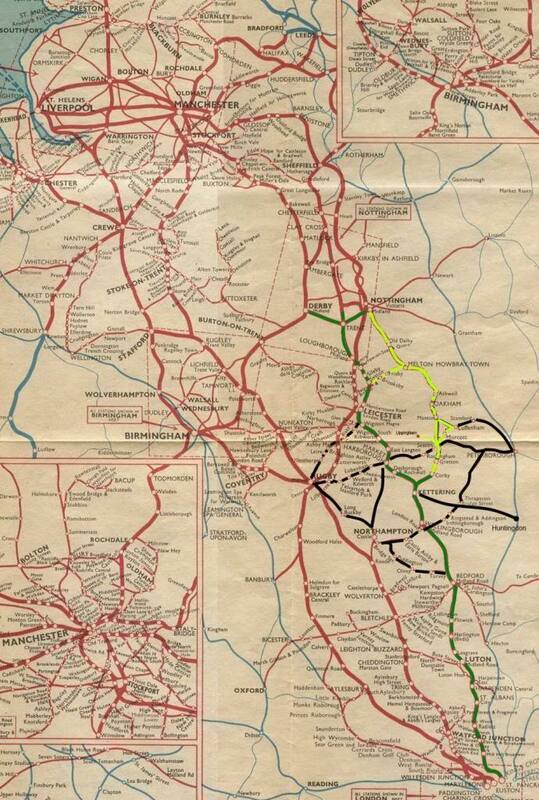 The first one is a steal from one of Dannys ideas of showing the route in the context of a system map. And now a few of the new stations. I am so pleased to hear that you and your family are OK apart from painful aches. Take care when using the computer as we can all wait for TT V2. The station screenshots show your usual attention to detail, and show that the wait will be worth it. Looking really good Clive! I for one can't wait to see this out for everyone to have a go on! Just don't be in any rush to do so, no matter what people say! Just take your time on it and get yourself better! Sorry to hear about the accident. Hope you get better soon. The extension looks really good and look forward to driving it in the future. Please look after your health though especially your back. Excellent work Clive. I'm amazed at how quickly you make progress. Hope you're soon feeling fully recovered. 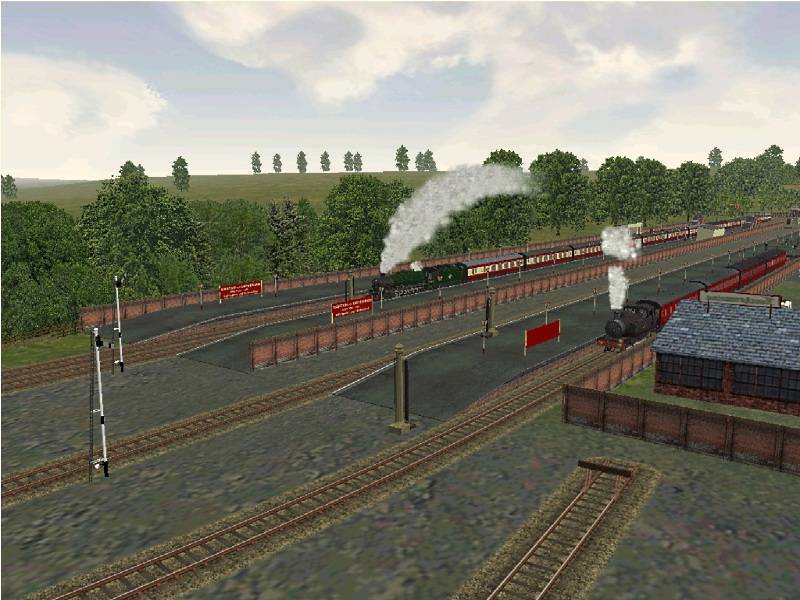 All scenery, signalling etc is now completed from Nottingham to Peterborough, Nottingham to Corby and Syston to Melton. Gives me a chance to run the route and start planning activities for the new sections. Already, the route size is nearly twice the original (840 mb against 549mb) which does indicate that the version 2 download is going to be pretty big. Next stop is the Bedford -Rugby -Leicester section. A few grabs of Peterborough. 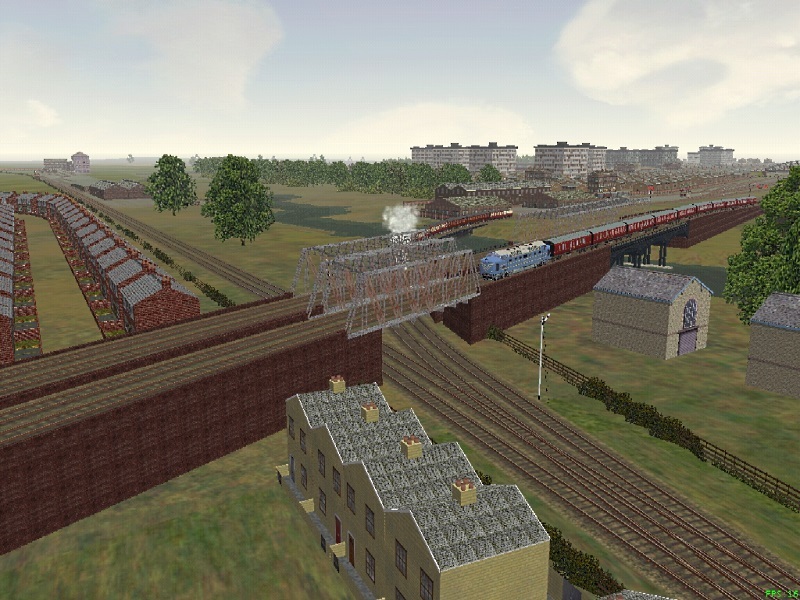 A few views of the bridges and sidings, with the Deltic prototype in attendance on the ER line.